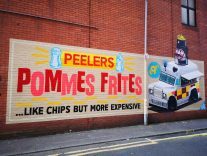 Everyone in the UK (and beyond) has heard about the political murals in Belfast, Northern Ireland. In fact, that was pretty much the only thing I knew about Belfast before I came here. However, after spending several days exploring the city, I discovered that there is far more to Belfast than it’s difficult past. 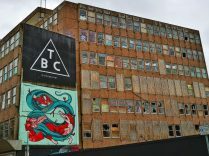 Yes, the murals are still there, but there is a buzzing street art scene which has emerged in Belfast, where a different kind of art is taking over from the traditional political murals. 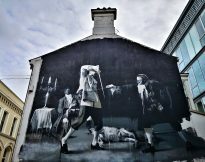 Walking around the Cathedral Quarter, I was blown away by the Belfast street art all over the walls, so I’ve put together a collection of my favourite pieces of street art in Belfast. Belfast still bears the marks of Northern Ireland’s violent past. Although the political conflict known as ‘The Troubles’ is over, there are some areas of Belfast where Republican and Loyalist communities are still segregated, and old rivalries are hard to forget after decades of violence which claimed the lives of over 3500 people. It must be difficult to move on when there are murals all over your neighbourhood. Some of the murals have changed in the last few years, to be replaced with murals of peace and unity, but some remain as memorials to the fallen, and as constant reminders of what was effectively a civil war. The Peace Wall marks a boundary between Republican and Loyalist Communities, and gates between the two are still closed at night to prevent any potential clashes between the two. 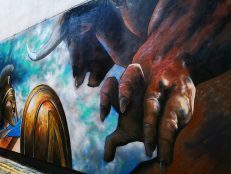 Murals on the Falls and Shankill Roads are certainly worth visiting, and there are plenty of Belfast mural tours and Black Taxi Tours you can take to learn more about the murals and the Troubles. 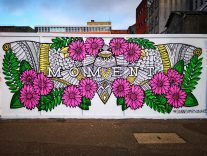 The Cathedral Quarter in Belfast is now home to a new kind of mural, where street artists from all parts of the community, and from across the world, come together to share a new vision of the future. 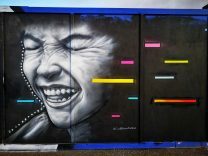 Walls are covered in colourful grafitti murals which are telling different stories, and even if we don’t know exactly what the artists want to say, there is no segregation here. To find some of the street art in Belfast I checked out the Urban Kultur blog which has an article about some of the street art you can find in the area. 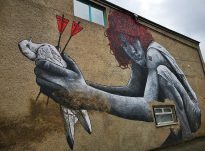 I also met Adam from Seedhead Arts, who is a street artist himself and explained more about the meaning of some of the murals, including a couple of his own works. 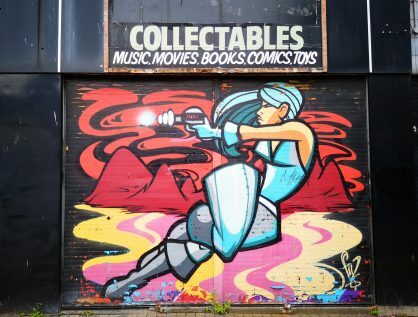 If you would like to learn more about each piece of art instead of just getting pretty pictures, I definitely recommend taking the street art tour arranged by Seedhead Arts, which runs every Sunday at 12pm. BOOK YOUR TOUR or read the reviews on Tripadvisor. Inbetween my two explorations there was a street art festival in Belfast as part of Culture Night, so on my second walk around the area, there was a lot more to see. 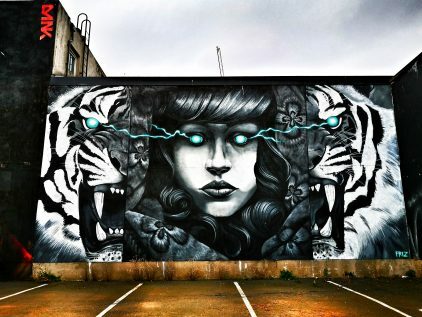 That is what I love about street art, it is changing all the time. Old murals are painted over to create new pieces of art, although unfortunately that also means that some beautiful works get replaced or defaced with new art and grafitti tags. 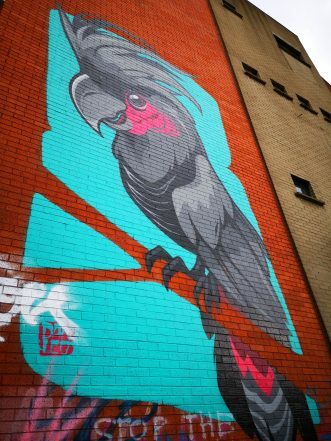 The Cathedral Quarter has the highest concentration of street art in Belfast. Murals and art pop up all over the neighbourhood, and while some are easily found by just walking the streets, some require a detour and keen eyes to spot. 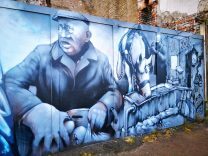 North Street between Royal Avenue and Union Street has a stretch of paintings which you have to see, and across the road, in Winetavern Street Car Park you’ll find some more murals, including my favourite (if it is still there!) from a Colombian artist. 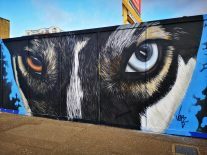 Belfast Street Art – feeling Wolfy? Hill Street and Talbot Street have more, as does the corner of Academy Street and Exchange Street. The Sunflower Pub is also a street art hub, with more works on Union Street and Kent Street. 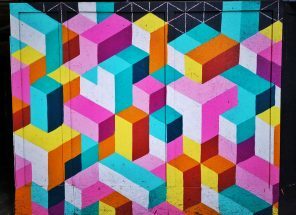 I’m working on a Belfast Street Art Map to help you find the key hot spots for street art, but if you walk around this area you are bound to find some wonderful pieces! 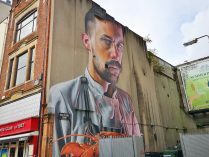 The Cathedral Quarter is the best place to stay if you want to explore the street art in Belfast. The trendy Bullit Hotel (check reviews on Tripadvisor) is a good option which also has its own hidden street art viewable from the roof terrace, or if you are on a tighter budget I stayed at the Ramada Encore (check reviews on Tripadvisor) which is just opposite another of my favourite pieces of street art (below). If you are backpacking Belfast then the hostels tend to be further out of town, closer to the University. 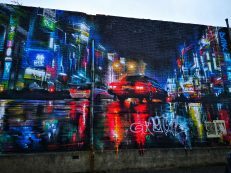 I also stayed a couple of nights at the Global Village Hostel (check more reviews) which is about half an hour walk from some of the best Belfast street art. 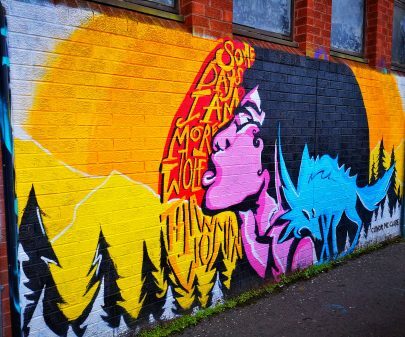 What do you think about the street art in Belfast? 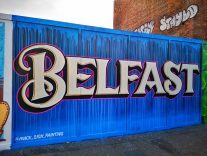 What is your favourite piece of Belfast street art? Share your thoughts in the comments below. 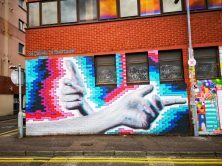 Here are a few more cool pieces of Belfast street art for your viewing pleasure, click on an image to zoom in. 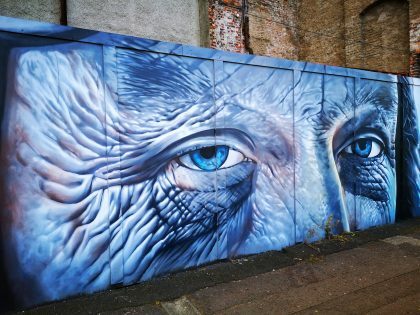 Traditional Belfast Street Art – A Colourful face! Love this! 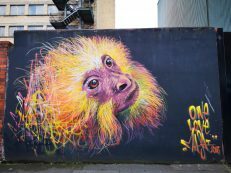 I would love to do a street art tour of Europe! Been flicking through your blog and was going to say “get yourself to Northern Ireland ffs”. But you already have! Very thorough too!! 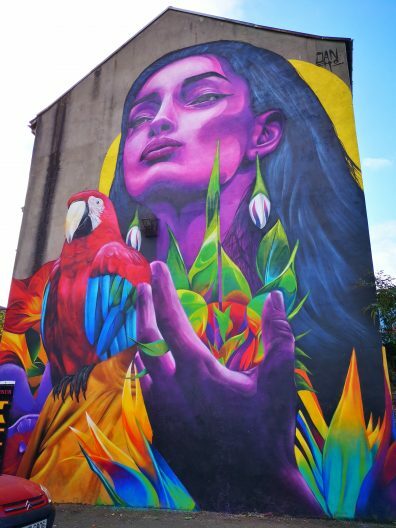 The street art in Belfast is beautiful, especially at Cathedral Quarter. 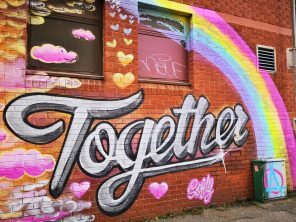 Glad to know that political murals are slowly being replaced by more colourful, positive images. Street art intrigues me particularly because I live in a country where it is banned and illegal. 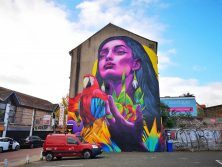 Belfast even has a street art festival, wow! Street art impresses the heck out of me Claire. Folks spending hours and days and weeks crafting these masterpieces is just fabulous. I would be interested in the war era stuff, remembering all the news headlines when I was a kid. I love your photos.